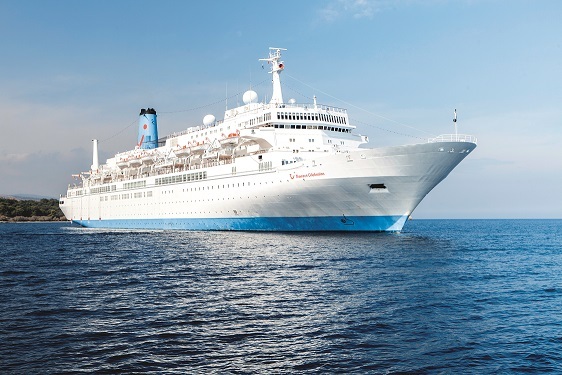 Dubai will be the new home port for Thomson Celebration this winter as the ship operates a selection of exciting itineraries in the Arabian Gulf. The region is the hottest destination of choice for holidaymakers seeking winter sun combined with exciting sightseeing and world-class shopping. The ports of call on a Gulf cruise are close enough together to allow passengers to spend more time ashore – where there is lots to see. Flying time from London to Dubai is a comfortable 7 hours or so – shorter than the time to get to that other winter favourite, the Caribbean. From Dubai, Thomson Celebration will sail a choice of two different seven night cruises. Arabian Nights visits Doha, Qatar; Muscat, Oman; Khor Fakkan, UAE, and Abu Dhabi. The Cities of Gold itinerary includes Manama, Bahrain; Muscat, Oman; Khasab, Oman; and Abu Dhabi. There’s an unmissable selection of shore excursions in each port. Dubai is a city that needs no introduction. It does it’s own thing, and does it big. Case in point, the ear-popping spire that is the 829-metre high Burj Khalifa, tallest building in the world. At the Palm, it has created a series of man-made islands which are home to luxury hotels such as Atlantis, and The One And Only, plus a collection of extravagant homes – many owned by Premiership footballers. There are 1,200 stores in the sprawling Dubai Mall, which is also home to a ski slope which brought snow to the desert for the first time. Taste of Modern Dubai: This excursion includes the most opulent hotels and landmarks that Dubai is famous for. Visit Palm Island, the ultra luxurious “seven star” Burj al Arab, and Burj Khalifa where you will be whisked to the viewing platform on the 124th floor for the most spectacular views of city, desert, and sea. Classical Dubai: Perfect for an allround taste of the city. Explore the Museum at Al Fahidi Fort, wander through the souks and experience the flashy Sheikh Zayed Road. Dune Dinner Safari: Head to the deep desert dunes for a magical evening watching the sunset. Abu Dhabi is in head-on competition with Dubai for the flashiest skyscrapers, although it has yet to build anything as high as Burj Khalifa. The most popular Abu Dhabi shore excursion is to Ferrari World, the largest indoor theme park on the planet, with the world’s fastest rollercoaster. If the adrenaline thrills are too much, there are more sedate rides available, and a host of excursions. From Khasab, take a 4×4 safari drive into the dunes: Venture out on a drive to the top of Jebel Harim to explore the natural beauty and the panoramic views of Khawr Najid. and a photo-stop outside the Bahrain World Trade Centre. Bahrain Ancient and Modern showcases the fascinating contrast of Manama’s old and new with skyscrapers, hotels and busy roads intertwined with the old town and traditional way of life. There’s another 4×4 safari available at Khor Fakkan, this time into the Masafi mountains and the lush Wadi Shawkah oasis.